Weapons have a quality range from "Basic" to "Super". The quality defines the distance of the projectile, its damage and the delay before the hand becomes accessible again (higher is the quality, shorter is the delay). Brawling and swords categories are impact weapons. When you use them, their endurance percentage decrease and when this percentage reaches 0, the item disappears from your hand. Before it reach 0, you can bring the weapon to a shop to have it repaired for a small fee. The percentage is displayed in the information box when you pick it up. Swords have a maximum distance range of 2 tiles. Your first long range weapons. Once you get your hands on a Magnum, you'll hold it for a long time! Handguns have a maximum distance range of 6 tiles. Rifles are good to have because they allow you to hit floating encounters without using the Anti-Grav device. The Hunter is a pretty powerful weapon too. Rifles have a maximum distance range of 15 tiles. The nice thing about the Booster is that it fires 3 shots: One on the left, one in the middle, one on the right. Wherever the encounter is in front of you, you can be sure you'll hit it if it's at the same height as the droids. Automatics have a maximum distance range of 12 tiles. The Ion-Pulse is a fine weapon, but the Hand-Laser and Lyte-Zapper are not worth much. Don't waste money on these two. Lasers have a maximum distance range of 30 tiles. Shells are the most dangerous projectiles because they bounce back on walls and doors. If you fire more than one shot on the encounter and it dies on the first shot, all remaining shots will bounce back to you if there's a wall or door behind. Cannons have a maximum distance range of 50 tiles. The most powerful weapons. Not only they hit hard, but they also go through the encounters to hit other encounters behind. Ammunitions are pretty hard to find because a base must have at least 7 shops to offer spraygun material. Sprayguns have a maximum distance range of 45 tiles. Balls are a form of weapon. Like any other object, they cause damage upon impact, but the main difference lies in the fact that they bounce off of walls for a few seconds. Having this knowledge while an encounter is coming close, a ball can be thrown on a wall while the droids run away or prepare for battle. Once the encounter reaches the path of the ball, it will be hit. Super Balls look identical except that they bounce longer and provide more damage than a standard ball. When your leader's hand touches a power socket, it becomes charged with 4200 units of electricity and can fire electric bolts to damage encounters. Each bolt will remove 420 units of electricity, but since the charge constantly decreases from the hand, it will allow you about 9 bolts per charge. This method is only useful at the beginning of the game since it doesn't do enough damage to strong encounters. Each bolt travels up to 4 tiles with damage equivalent to the leader's dexterity level. Zlots are free weapons found behind closed cupboards that can be operated without requiring any specific skill. There is one type of Zlot for every type of original weapon mentionned above and look exactly the same. They cannot be reloaded with fresh ammunitions and cannot be repaired at a shop. The danger of using a Zlot is that it will explode in your hand when it jams, which may cause damage to the droid holding it, but there's only a 0.3% chance of this event to occur. Invisibly, the dexterity of a droid using a Zlot weapon is increased by 30, giving the impression that the Zlot weapon is slightly stronger than the corresponding original weapon at the expense of being twice the weight of it. Below is the list of Zlots with their equivalent weapon. The damage caused by an explosion is no different than damage caused by a projectile. The game simulates a hit as if an attack was performed at the location of the explosion. Like any projectile, damage is calculated by a distance, impact and force. Usually, the distance is the space between a projectile's initial location and the location where is has hit something. An explosion doesn't really have a distance, but the factor is still used for calculations. Distance: Current base number (up to 15) * 16 + 14. Final range is between 14 and 254. Impact: (Random number / 256) with a minimum value of 129. Final range is between 129 and 255. Force: (Impact / 8) + Distance + 32. Final range is between 62 and 317. Impact: Leader droid's dexterity + 1. Final range is between 16 and 254. Distance: Leader droid's dexterity * 256 / Impact. Final range is between 16 and 254. Force: Impact + 20. Final range is between 36 and 274. Yes, it is odd to think that the damage caused by a camera explosion is proportional to the dexterity of the droid who activates the explosion. This is somewhat invisible to the player since the dexterity skill of all droids are usually quite equal. 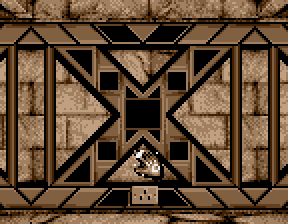 Doors and raiser walls are a form of weapon because they can crush encounters. Doors inflict 400 points of damage while raiser walls inflict 1600. The droids require a certain level of skills before being able to use different quality of weapons. Each item of a category can be used after 8 points of their related skills. Once 9 points of skill has been reached, the next category is available. The damage is calculated between a minimum and maximum range. The actual value generated by the game is based on the weapon's type and quality, along with the droid's dexterity skill. Unless one of these parameters change, a shot provided by a weapon will always discharge the same damage, but the damage received will slightly be modified randomly and also depends on the encounter's armor, skill and distance. For example (totally made-up numbers here! ), a Shotgun-IV shot with a dexterity of 16 will always generate a damage of 4150 when coming out of the weapon, but a far encounter of strong armor might actually receive 825. The force of impact related to the distance between the droids and the encounter is calculated by the value of the multiplier column of the table below. At the time of impact, the basic damage is multiplied by this value. Each time a projectile moves (twice per floor cell as explained in the "Flying Items" technical page), its multiplier is reduced by 1. If it reaches 0, the projectile dissipates. Because of this, the multiplier can also be seen as the projectile life span. You will notice that the damage by the Sprayguns is way lower than other weapons. It's important to realize that gas clouds generated by these weapons may affect the entire group and not only the individuals in front, and that they may even affect other groups standing behind. Indeed, when facing a single encounter, a Spraygun will be weaker than a Cannon, but when facing multiple encounters, a Spraygun can be so much more powerful. When a weapon is used, an amount of time is required before the droid can recharge the hand. This delay depends on the weapon type and quality.